The aim of subatomic physics is to understand matter and the fundamental forces in the universe and ultimately form a Theory of Everything. The Standard Model of Particle Physics beautifully brings together three of the four forces of nature (strong, electromagnetic and weak) in a framework encompassing 6 quarks and 6 leptons, and the gauge particles which mediate their interactions (photons, W and Z bosons, the Higgs particle, and gluons). Ultimately, we hope to incorporate the fourth force in nature, gravity, into this Standard Model, and the leading candidate theory for a Theory of Everything is String Theory. Nuclear physics studies how fundamental forces behave in nuclei and has numerous applications in astrophysics, nuclear energy, and nuclear medicine. Studying nature's tiniest particles, ironically, tends to require the largest experimental facilities found in physics. UBC's experimental particle physicists conduct experiments at several of the largest particle physics facilities in the world: the LHC at CERN; SNOLAB; KEK and J-PARC near Tokyo. At UBC, we have such a facility on campus, TRIUMF, which serves as national infrastructure laboratory for all Canadian particle physics projects. At UBC, particle theorists are working on the cutting edge of understanding the universe around us. They lead and participate in major workshops, on campus and worldwide. Facilties and resources on campus include the Pacific Institute of Theoretical Physics, and the Pacific Institute for the Mathematical Sciences. The ATLAS experiment at the Large Hadron Collider is the world's premier high-energy collider for looking for new particles at the highest energies ever probed by accelerators. The Standard Model has several mysteries that will be probed by ATLAS. 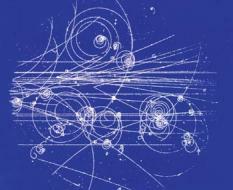 In 2012 the LHC discovered the Higgs boson that gives particles mass. Dark matter, seen in astronomical and cosmological observations, is missing from the Model, and these measurements suggest it could be produced and studied at the LHC. Grand Unified Theories that unify the known forces often predict new symmetries and forces that may be evident at LHC energies. The Belle II experiment will look for evidence of new physics using electron-positron collisions at the KEK laboratory in Japan. With 100 times the data of our previous experiment, it will produce a broad set of measurements that are sensitive to new physics at energy scales beyond the reach of existing particle colliders. These indirect measurements are complementary to the direct observations of new physics that we anticipate at the LHC. Belle II will also have unique abilities to search for the direct production of new particles predicted by extensions to the Standard Model, such as the Dark Sector. (Christopher Hearty, Tom Mattison, Janis McKenna). RK = Γ(K+ → e+νe)/Γ(K+ → μ+νμ). This experiment (E36) was performed at the lower beam intensity available at K1.1BR in 2015-16 and the data is currently being analyzed. E06 is a measurement of the transverse muon polarization, PT, in the K+ → μ+π0νμ decay of stopped K+ mesons (Kμ3). In the SM PT ~ 10-7 and there are several theoretical models which predict non-zero values as high as 10-3. This experiment was originally proposed using a stopped K+ beam and a 12-sector superconducting magnet to analyze the outgoing μ+ and its subsequent e+ decay. However, due to the slow increase in the accelerator beam power we are presently evaluating a different experimental method using a segmented calorimeter which can preserve the muon polarization until it decays. This would provide a very significant increase in solid angle and allow us to make a 10-4 to 10-5 measurement at the current J-PARC K+ intensity. The UBC TREK group ( Mike Hasinoff & TRIUMF collaborators ) was responsible for the construction of the highly-segmented scintillating-fibre stopping target at TRIUMF and we are continuing to upgrade our tracking software routines to analyze the target data. High precision measurement of the ultra-rare kaon decay K+ → π+ + νν (KPNN) at the CERN experiment NA62 will provide one of the most incisive probes of quark flavor physics. The KPNN branching ratio is sensitive to new physics models not easily accessible by other reactions which extend the Standard Model (SM) to solve its considerable problems. The SM prediction for the KPNN branching fraction is theoretically robust at the 5% level. Only a precious few accessible 2nd order weak interaction quark processes can be predicted with this level of certainty. The suppression of the KPNN branching fraction in the SM to the level 10-10 allows physics beyond the SM to contribute dramatically to the branching fraction. The certainty with which the SM contribution to KPNN can be predicted permits significant discovery potential for new physics with sensitivity to probe a wide variety of models of new physics with mass scales well beyond the direct reach of the Large Hadron Collider. NA62 is a high-tech experiment that expects to have sensitivity for observing 80 events at the SM level for KPNN covering most of the parameter space for new physics models to contribute. It will also study many other rare or forbidden reactions to search for dark matter, heavy sterile neutrinos, neutral pion decays, and radiative processes. In addition, searches for axion-like and hidden sector particles are being investigated using an alternate mode of operation. UBC and TRIUMF groups participating in NA62 are involved in challenging hardware and analysis software projects. Over the last four years the nEXO collaboration has developed a conceptual design for the nEXO detector, a tonne-scale neutrinoless double-beta (0νββ) decay experiment utilizing 136Xe and conceived to be placed at SNOLAB to push the search to the next frontier. Neutrinoless double-beta (0νββ) decay has been recognized to be one of the most sensitive avenues in the search for physics beyond the Standard Model. Indeed, the observation of 0νββ decay would, in one stroke, discover lepton number violation and elementary Majorana fermions. Since the decay also requires neutrino masses to be finite, the recent discovery of neutrino oscillations has increased the interest in the search of this process worldwide. Most recently, in the US the search for 0νββ decay was assigned the highest priority for new initiatives by the 2015 Long Range Planning for the nuclear physics community. The UBC/TRIUMF efforts focus on the development of advanced photodetector technologies, in particular Silicon Photomultipliers (SiPM), as well as R&D efforts for detecting the Ba ions produced in the decay of 136Xe (Ba Tagging) (Kruecken, Dilling). The quest for developing a unified description of all nuclei and nuclear matter and a full understanding of the origin of the heavy chemical elements as well as for testing the standard model of particle physics with precision experiments in atomic nuclei is driven by the study of nuclei far from stability. 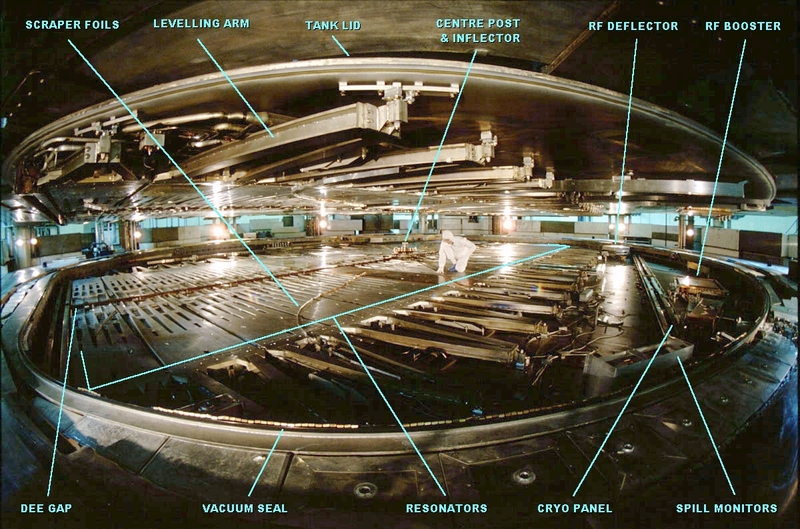 The Isotope Separator and Accelerator (ISAC) facility at TRIUMF is one of the world leading facilities for producing a wide variety of intense beams of exotic nuclei produced using the ISOL method via the bombardment of thick high-power targets with up to 100 μA of 500 MeV protons. The short-lived isotopes can be delivered to experiments using low-energy (<60 keV), available since 1999, or re-accelerated beams. For re-accelerated beams two acceleration stages are available, the first for energies of 0.15 to 1.8 AMeV since 2001, designed for high intensity RIBs for studies of nuclear reactions relevant for nuclear astrophysics, and a second stage for energies of at least 6 AMeV for masses of A<150 for nuclear reaction experiment. A wide range of experimental set-ups is available at the ISAC facility to investigate questions of current interest in nuclear astrophysics, nuclear structure and reactions, and electro-weak interaction studies, a few of which are listed here. TRINAT uses the pressure of laser light to hold atoms of beta-decaying isotopes in a mm-sized cloud, then deduces the (otherwise invisible) neutrino momentum from the momenta of the other freely escaping products. The Standard Model prediction for the direction of neutrino emission would be perturbed by new interactions. TRINAT has made the best measurements of these effects, and the planned upgrade to 0.1% accuracy would assist the LHC's search for non-Standard Model particles by constraining (or hopefully measuring) their interactions with the first generation of quarks and leptons. A new effort will trap atoms of francium, the heaviest alkali atom (easily calculable like hydrogen), and search for new parity-violating interactions. Electromagnetism respects parity-- it is the same when reflected in a mirror-- but many new interactions don't (Behr). The TITAN Experiment uses ion traps to carry out the most precise mass measurements on short-lived exotic isotopes. The experiment makes use of the world-leading on-line facility ISAC at TRIUMF on UBC campus to help test the Standard Model and test modern theoretical models that connect nuclear forces with underlying fundamental strong interaction. Nuclear astrophysics and nucleosynthesis are the other driving motivations for the experiments at TITAN (Dilling). Excited states in exotic nuclei are studied via gamma-ray spectroscopy following beta decay, with the GRIFFIN spectrometer, or nuclear reactions, with the TIGRESS spectrometer. These powerful microscopes provide insights into the nuclear dynamics and shell structure far away from stability and test modern theoretical models that connect nuclear forces with the underlying fundamental strong interaction. The IRIS solid hydrogen target experiment enables reaction studies even further away from stability using lower intensity radioactive ion beams. Aside from studying the nature of atomic nuclei this suite of experiments is also essential for the study of nuclei that play a role in the astrophysical r-process, which is responsible for the synthesis of half the chemical elements from iron to uranium. The study of these nuclei in the laboratory, combined with astrophysical simulations and the new era of multi-messenger astronomy, will help elucidate the origin of the heavy elements in the universe (Kruecken). TRIUMF is Canada's main centre for accelerator and beam physics expertise. UBC graduate students (and co-op or summer undergradutae students) may participate in research projects with TRIUMF physicists, either in developing or adding to the lab's existing accelerators and particle beams, or in collaboration with other laboratories. Electro-magnetic modeling of the rf accelerating structure, which consists of 80 separate resonators (right), permitting excitation of undesirable high-order modes. To better understand and suppress these, a 3-D electrodynamic model is being developed. Diagnostics for very-low-intensity ion beams. TRIUMF physicists are also participating in the EMMA project - a 20-MeV electron model of a 20-GeV muon accelerator. 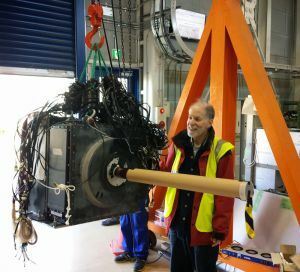 This is a novel type of FFAG accelerator that has been designed by an international collaboration (and is being built at Daresbury Laboratory in the UK) to test the feasibility of abandoning the restrictive "scaling" principle traditionally observed in FFAG design. This type of accelerator, which offers very high pulse rates and beam intensities, is of great current interest for neutrino factories, muon colliders, neutron sources, industrial irradiation, driving sub-critical reactors, and cancer therapy with ion beams (which offer better dose localization than X-rays). For the latter application TRIUMF is also developing new beam dynamics software for the design of small-aperture proton or carbon FFAGs suitable for hospitals. ALPHA is an international collaboration based at CERN that produces and traps antihydrogen atoms, the antimatter counterpart of the simplest atom, hydrogen. By precise comparisons of hydrogen and antihydrogen, the experiment tests fundamental symmetries between matter and antimatter. The Canadian group (ALPHA-Canada) including Hardy (UBC), Hayden (SFU), and several TRIUMF physicists, contributes to both the particle physics and atomic spectroscopy aspects of the experiment, from ion and atom trapping, to manipulation of cold plasmas, to precision laser and microwave spectroscopy, and sophisticated particle physics detection and analysis. Hence it is an excellent training ground for students. Graduate students typically spend up to several months a year in Geneva to participate in the experiment. To date, ALPHA has measured the 1S-2S atomic transition in antihydrogen to an accuracy of about 2 parts in 1012, as well as measurements on the 1S-2P atomic transition, and hyperfine transitions. Current work focuses on measuring the effect of gravity on antimatter. For the graduate student, these projects offer a great opportunity to work at the worlds leading particle physics facilities. Although some particle physics collaborations may be large, we do work in small groups, alongside peers from all parts of the world. Students have the opportunity to gain expertise in many different areas, from high-speed computing to large-scale engineering. While TRIUMF is Canada's national laboratory for particle physics, students may have the opportunity to conduct their research and to spend some time living and working at major physics laboratories andfacilities around the world: in Switzerland, California, Chicago, Japan, and Northern Ontario. Graduate students will typically be offered opportunities to present their research at national and international conferences. For more detailed information about ongoing Subatomic theory research, please consult the Professors' web pages directly.